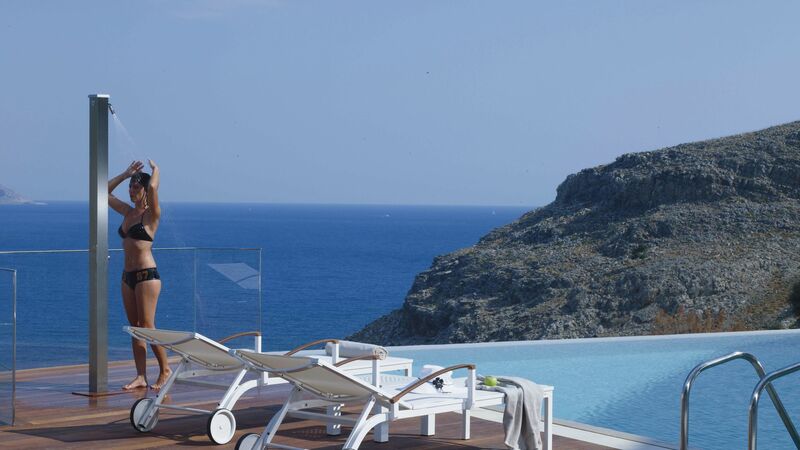 The Lindos Blu Hotel and Spa offers an exclusive tranquil sanctuary on a hillside overlooking the exquisite Vlicha Bay. Located just outside of Lindos village, you can enjoy a romantic and intimate atmosphere, perfect for couples, with fresh, modern décor and design. Unique architecture and opulent interiors create an idyllic couples’ only retreat, with excellent, personalised service. Select from contemporary sea view suites, villas and maisonettes where you can relax in a bright and airy setting and take in the beautiful design and panoramic views. When you want to soak up the sun there is also a choice of swimming pools and staggered sun terraces that cascade down to the sandy beach. This sophisticated hideaway is a member of the Small Luxury Hotels of the World and offers an indulgent spa, where a small stream carries good “chi” through the centre of the hotel from the hills down to the sea below. This hotel is adults only, guests under the age of 17 years are not permitted. The hotel has 70 rooms and 3 lifts. The beach is accessed by a short downhill path. This hotel may not be suitable for guests with limited mobility. 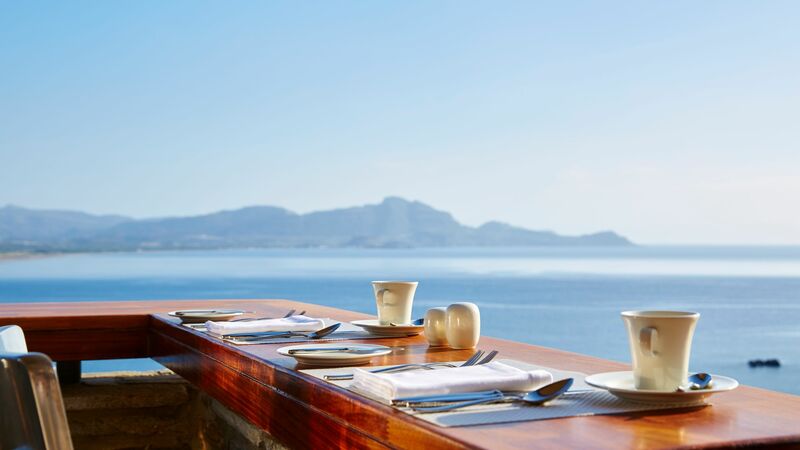 Open for breakfast, lunch and dinner, guests can dine al fresco on a beautiful terrace overlooking the sparkling Aegean Sea. 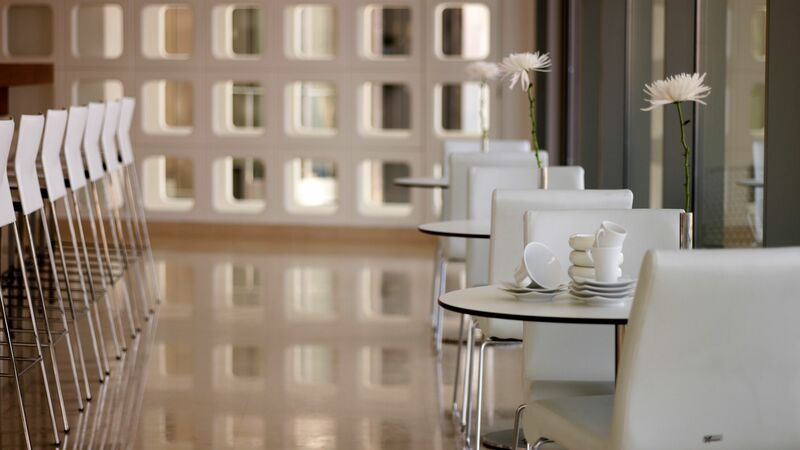 Enjoy a lavish breakfast buffet, or an a la carte lunch including Greek mezze, with snacks served throughout the day. Guests can choose from sumptuous Greek-Mediterranean dishes at the buffet in the evening, which features tantalising salads, cheeses and desserts. Gentlemen are requested to wear long trousers in this restaurant. For safety reasons, shoes are to be worn at all times. Enjoy an unforgettable dining experience on the terrace overlooking the azure sea under the twinkling stars. Experience creative, locally produced, gourmet cuisine with Mediterranean and Greek flavours. Gentlemen are requested to wear long trousers in this restaurant. For safety reasons, shoes are to be worn at all times. No swimwear is to be worn and reservations are required. Sample signature cocktails and refreshing cool drinks at this poolside bar as you soak up the Greek sunshine. Guests can also enjoy light bites and salads beside the infinity pool. 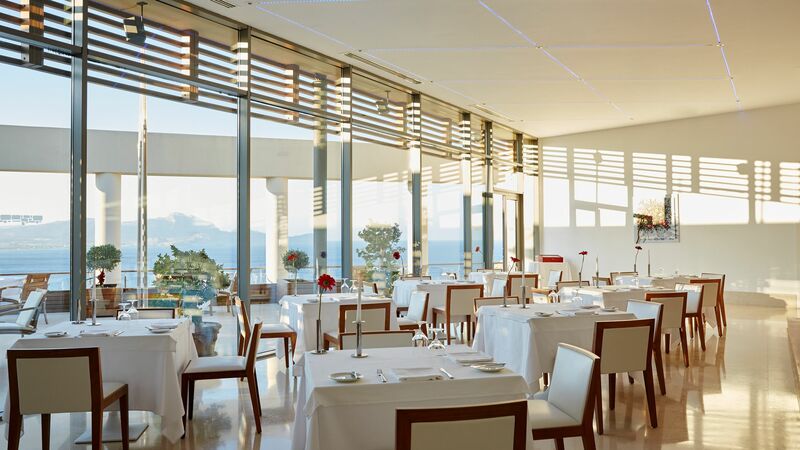 Relish the panoramic sea views, cocktails and impressive service in this contemporary and stylish lounge bar. Sample an extensive selection of wines, spirits and champagnes perfect for a pre or after dinner drink, accompanied by smooth tunes. Relax on the plush sunbeds or take a dip in the Jacuzzis as you witness uninterrupted views of beautiful Vlicha Bay. Guests can also enjoy refreshing juices and snacks. Wander down to the powdery golden sands of the Blue Flag Beach where you can relax and unwind and catch some rays. The beach is approximately 50 metres down the hill from the hotel. 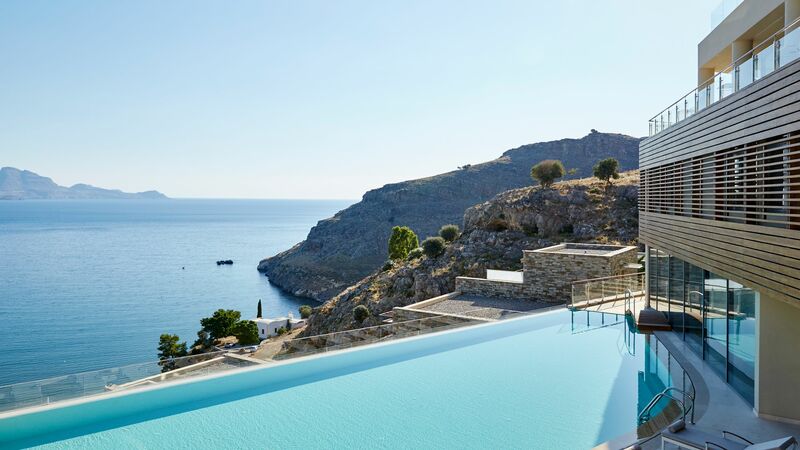 Guests will be spoilt for choice with an outdoor, freshwater infinity pool overlooking the Aegean Sea, in addition to a heated indoor swimming pool. There are also rooftop Jacuzzis on the terrace. Guests can indulge in state of the art facilities, natural ingredients and holistic and therapeutic Greek ritual treatments. Enjoy Thai and hot stone massages, facials and reiki that will relax and rejuvenate the body and mind. If you fancy a workout then the fully-equipped gym with panoramic views of the Vlicha Gulf will not disappoint. The gym, Jacuzzi, steam bath, pool and sauna are complimentary for all hotel guests. Four your convenience, there is a mini market/newsstand at the hotel, in addition to a car rental office for guests who wish to hire a car and see the island. There is also a jewellery shop perfect for holiday souvenirs. Found in a pretty bay on the south east coast of Rhodes, Lindos Blu Hotel & Suites is in the beautiful town of Lindos. Here you’ll find narrow streets and whitewashed houses built into the side of a hill and overlooking the sparkling Mediterranean Sea below. Above the town is the magnificent castle, surrounded by emerald green woods, and steeped in history. Wander through the town and duck into local restaurants and tavernas, or simply watch the world go by from a café with a coffee in hand. There are boutique shops and galleries where you can pick up local handicrafts, and painted pottery is a town speciality. Lindos Blu Hotel & Suites is an hour and 10 minutes’ drive from Rhodes Airport. Double Rooms have a large balcony or terrace with spectacular views over Vlycha Bay. Glass separates the bathroom from the bedroom which has large doors to outside offering lovely views that are visible throughout the room. Single Rooms are the same as the Double Rooms but are for sole use and have a large balcony or terrace with spectacular views over Vlycha Bay. Glass separates the bathroom from the bedroom which has large doors to outside offering lovely views that are visible throughout the room. Junior Suites are spacious and have a comfortable seating area as well as a large balcony or terrace with spectacular sea views. These Double Rooms have direct access to a swimming pool that is shared with another nearby room and beautiful views of the sea. These Junior Suites and are decorated in a modern style with an elegant seating area and direct access to a swimming pool that is shared with another nearby room and has fantastic views of the sea. Double Deluxe Rooms are stylishly decorated and feature a king sized bed. They boast a large balcony with an outdoor whirlpool and a bathroom that is approximately 15m². Villas are elegantly designed and consist of a bedroom and separate living room. The bedroom features an impressive bathtub and the outside space measures 50m² and has a terrace and a private heated swimming pool including a whirlpool. Maisonettes consist of either a stylish bedroom, spacious living room and a fully-equipped gym that is set over two floors or two spacious bedrooms and a spacious living room. The outside area measures 50m² and has a private heated swimming pool, whirlpool and stunning sea views. “ Wonderful!! Fantastic - book it!! My husband and I had an incredible stay at Lindos Blu. The hotel is superb, amazing staff, great gym, and I?? ?d highly recommend booking half board as the food was absolutely fantastic. We rarely go to the same hotel more than once but we?? ?re talking about going again! 5 stars ticked for everything - they are doing everything right!! If you are looking for a superlative experience with superb customer service, excellent food, fabulous accommodation, relaxed atmosphere in a beautiful location, then look no further. This is simply the best hotel in Greece. What a fantastic hotel. Booked through TUI which gives you a taxi transfer which is great as it?? ?s a 40 min drive from the airport. Check in was quick and included a nice welcome drink in the main bar overlooking the bay. All rooms have a see view. Our standard room included a bath and walk in shower. Breakfast was great and sparkling wine was available. Lunch around the pool was a great standard. We didn?? ?t eat dinner in the hotel as we love going into Lindos in the evening as it has great rooftop restaurants and bars. Which is a 5 min taxi away. Beautiful hotel in a stunning location, wonderful food with very friendly professional staff. The room was large, spotless and had an amazing views. We enjoyed the wonderful touches like gifts in the room and the free bottle of iced water at the beach. The hotel feels very modern with the glass and lifts yet has a feeling of relaxed elegance. Third visit to this hotel and the level of customer service amazes me. I did not think it could get any better but....yes it can. Iced water on the beach, a golf buggy to take you up and down, newly decorated rooms. However, the common theme is the amazing team right from the FOH to housekeepers to food service. Unbelievable and the best. Thanks once again and see you in 2019.